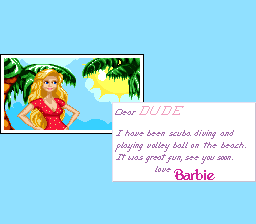 Barbie Vacation Adventure is an unreleased game by Hi Tech Expressions. It was supposed to come out in late 1994. Thanks to Retromags for the scans. 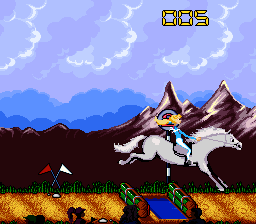 Of all the unreleased games on my list, I have to admit this game is probably the one that I least looked forward to. 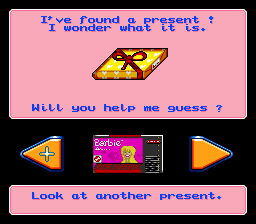 Barbie Vacation Adventure is a simplistic game that is clearly designed for very young children. 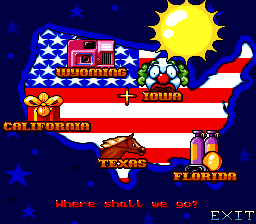 It is basically a series of mini-games in five settings around America. 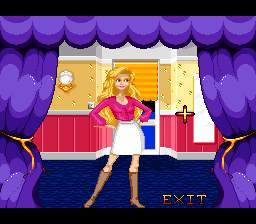 Before each stage, you can change the colour of Barbie's outfits, which I suppose caters to the audience of Barbie. Barbie herself looks nothing like the doll, but rather a more realistically proportioned person. 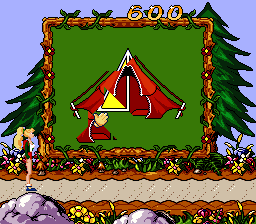 The mini-games are not really that challenging, but the controls can be somewhat frustrating. The graphics and music are not that bad, but definitely do not push the system to the limits. 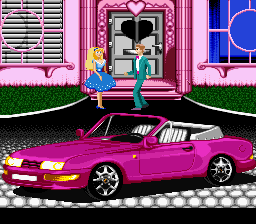 At the end, you meet up with Ken at the Barbie-mobile. 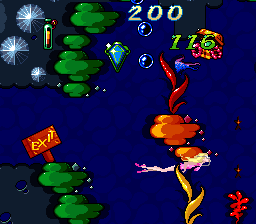 As above, the game was released at the end of September 1994. 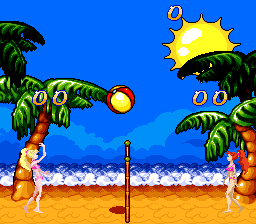 The game was previewed in EGM in the November 1994 issue. I would expect that the preview version used in that issue would have been the same as this prototype, given the timing (the screenshots look the same). 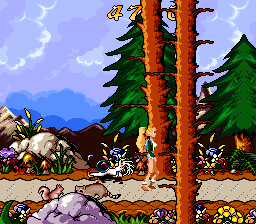 The EGM preview stated that it was 85% complete and should have been out in November 1994. The prototype has an almost complete valid header, except that the checksum bytes are zeroed out. Someone later on hacked the header to have the proper checksum values, and this has been floating around the Internet as a "good" dump. 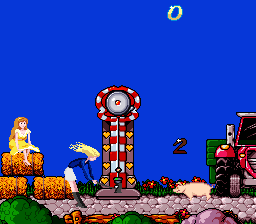 It is possible that this game is identical to what they would have eventually released, but we cannot be sure of that. The game was reviewed in Nintendo Power, so I would guess that it went through their review process at the very least. Neither Hi Tech Expressions nor Software Creations kicked the bucket at that time, so the only reason I can guess that this game was cancelled was because they didn't think it would sell enough to make it worth while. 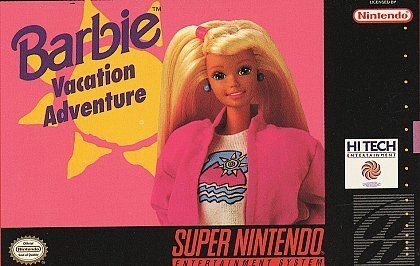 Five stages to vacation in Before each level, you can customize the colour of Barbie's clothes. 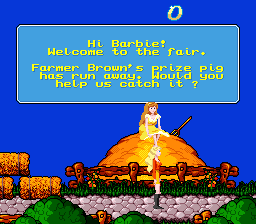 Can she catch the pig in Iowa? 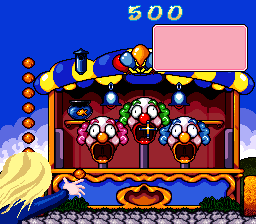 Shooting clowns. Take pictures of squirrels, racoons and skunks (?) 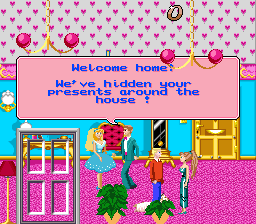 There's a party for Barbie in California, find the presents hidden throughout the house. I could not find the video game. At the end, you get a car. 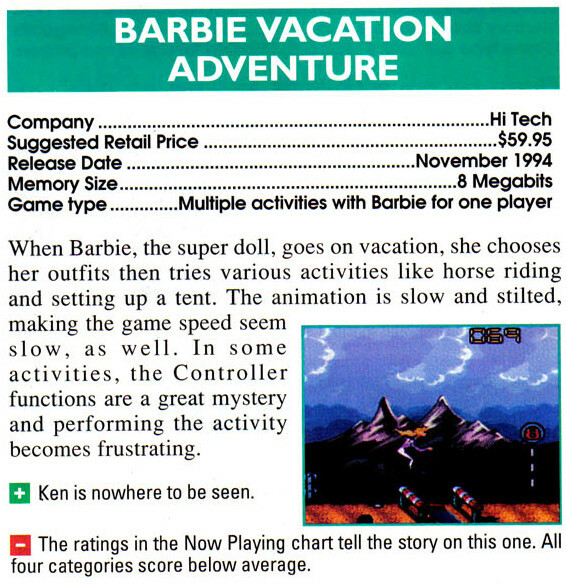 Review in the November 1994 issue of Nintendo Power (page 106). Blunt, to say the least. Review scores in the November 1994 issue of Nintendo Power (page 107).